Day 4: Through the Countryside — crunchy red fruit. I woke up and ran down to the Serein river, and followed the trail along the green water and rushes. The morning run has become my savior on trips like this, where we’re up late and drinking wine. It’s an opportunity to get the blood moving, clear my head, and get ready for the day. We headed straight through the rolling green hills to Chablis, where we stopped at the winery of Eleni & Edouard Vocoret. Eleni greeted us at the door to show us around. She’s a badass, just so you know. Lip ring, intense glare, sharp wit. She’s 9 months pregant, full term, ready to deliver her baby at any instant. She came to the door, showed us the winery, and tasted us on a few of their wines. They reflect the humor and attitude of the maker-creative, boundary-pushing, confident. I wish more women were winemakers, and that more of them were leading tastings. Eleni and her husband Edouard have great things ahead of them. After our tasting at Vocoret, we walked through the Chablis Grand Cru vineyard. This is a southwest-facing slope that overlooks the town. We hunted for fossilized seashells and eventually found one. We headed to Chablis and had our first beer in a long while, which was surprisingly refreshing. There’s something about having a beer after wine tasting that is particularly restorative. We had reservations at a restaurant called Fille de Zinc, which ended up being a great idea. (It was actually Eleni’s idea, she told us to go there). Amongst the four fantastic dishes we had, the best was a dish of asparagus fritters with a dijon mustard foam. I’d never tasted anything quite like it, and it disappeared quickly from the plate. Not only was the food and wine fantastic, but we ate overlooking the picturesque canal running through Chablis. Easily the best meal we’ve had in France. Next it was a fast drive through more verdant French countryside straight to Champagne. Here, the terrain moves from steeper slopes into lower, broader, more rolling hills. Hills that roll over the course of a mile or more, flat and massive. Our first stop was at Dhondt-Grellet, and we were greeted by Adrien, a young winemaker who took over from his parents six years ago. His wines were precise, bright, and full of character, and we were able to taste straight from barrel. When you taste from barrel in Champagne, you’re tasting vin clairs, which are the dry whites used to make sparkling wine. They’re very tart, acidic and intense. But these are the ingredients that create the rich, luscious wines we’ve come to expect from Champagne. And each winemaker seasons with these ingredients to make their magic. We then checked into our AirBnb, and dropped by Les Avisés in the village of Avize. We had tried to schedule a tasting with Jacques Selosse earlier over email, but had been rebuffed. Selosse is one of the Champagne producers that has inspired many sommeliers, myself included. These are special wines that are next to impossible to find. This winery makes about 20,000 bottles per year, which when you divide it across the world is very little quantity. 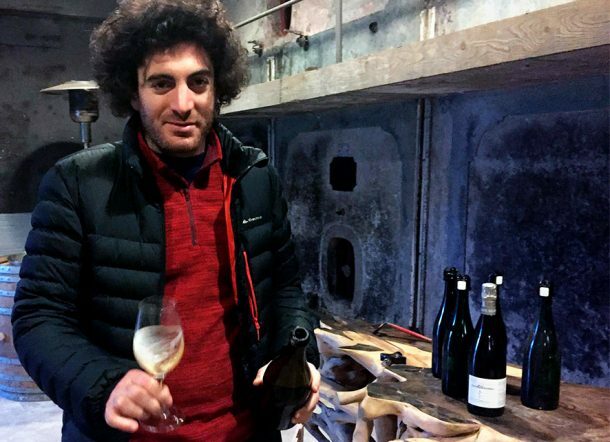 So when we found out that we’d be able to taste with Guillaume Selosse, we were elated. Guillaume popped into the room, wily and cagey, with a big friendly smile on his face. He looks like a cross between Elijah Woods’ Frodo, Ramsay Bolton, and Bruno Mars. He started pouring wines. Wines that we weren’t expecting to taste. Wines that are impossible for us to get. And then came the Substance. If you don’t know about Substance, it's a solera Champagne started in 1986. It’s a blend of more than 30 vintages. For someone like me who loves both Champagne and Sherry, it’s a pretty special bottle. Guillaume pulled a taste of the original reserve wine for us and we all stood tasting it in reverence. We weren’t deserving of this tasting, but we had the chance to experience it, and it will live in my memory forever. After Selosse it was off to check out the new spot in Épernay, “Sacré Bistro.” It’s a hamburger and fries joint with a killer Champagne list...a business model that I wish had more traction in the USA. I had a “Charlemagne” burger and we enjoyed some Champagne and Burgundy with dinner. It turns out our buddy Adrien from Dhondt-Grellet was there too, so I brought him some of our 2002 Roumier Clos de la Bussière. It’s a small world here in Champagne. We went back to the AirBnB and I slept like a chalk rock.